The PGA Tour's southern swing continues this week with another high-profile event at a pristine venue. The 2019 RBC Heritage at Harbour Town Golf Links in Hilton Head starts Thursday morning, and a winner will be crowned on Sunday. This oceanside course was designed by Pete Dye, Jack Nicklaus and Davis Love III and regularly attracts a quality field the week after the Masters. Matt Kuchar, Jim Furyk, Davis Love III, Greg Norman, Nick Faldo, and the legendary Jack Nicklaus are just a few of its past champions. Fresh off his second-place finish to Tiger Woods at Augusta, Dustin Johnson is the No. 1 player in the world again and the 15-2 Vegas favorite in the latest 2019 RBC Heritage odds. The 2019 RBC Heritage field is loaded, and with a par-71 course in sight, a little advice can go a long way. So, before you make your 2019 RBC Heritage picks, listen to the PGA predictions from the model at SportsLine. 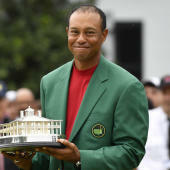 SportsLine's prediction model, invented by DFS pro Mike McClure in 2017, has nailed four majors entering the weekend and called Tiger Woods' deep run in last year's PGA Championship despite being a 25-1 long shot. The model has been spot-on early in the 2018-19 season. It was high on champion Rory McIlroy at the 2019 Players Championship, projecting him as one of the top two contenders from the start. It also correctly predicted Brooks Koepka's (9-1) victory at the CJ Cup earlier this season. Additionally, it correctly called Bryson DeChambeau's (9-1) seven-shot victory at the 2019 Omega Dubai Desert Classic. Anyone who has followed the model is way up. Now that the 2019 RBC Heritage field is locked, SportsLine simulated the event 10,000 times, and the results were surprising. One huge shocker the model is calling for: Jordan Spieth, a three-time major champion and one of the Vegas favorites, doesn't even crack the top 10. However, the 25-year-old has failed to win a tournament since his triumph at the 2017 Open Championship, and he's finished outside the top 30 in nine of his last 11 starts on the PGA Tour this season. His troubles can be directly attributed to his inability to find the fairway off the tee. He enters this week's event ranked 212th in driving accuracy percentage (49.26), which could cause trouble at Harbour Town. He's not a strong pick to win it all and there are far better values in this loaded RBC Heritage field. Another surprise: Webb Simpson, a 31-1 long shot, makes a strong run at the title. He has a much better chance to win it all than his odds imply, so he's a target for anyone looking for a huge payday. Simpson finished tied for fifth last week at the 2019 Masters, and his Official World Golf Ranking moved up to No. 20 from No. 23 as a result. He's missed just four cuts in his last 36 starts, racked up 12 top-10 finishes and won the 2018 Players Championship in the last season-and-a-half. He's playing some of the best golf of his career lately and is vastly undervalued in the 2019 RBC Heritage odds. Simpson ranked 31st or better in total strokes-gained on tour each of the last three seasons and his success has been buoyed by an exceptional short game. He's currently 11th on tour in strokes-gained around the green (0.470). At a well-bunkered course like Harbour Town, that short game will come in handy this week and allow him to climb the 2019 RBC Heritage leaderboard in a hurry.